We're taking a one year hiatus from our Chicago Golf Outing this summer. The tenth annual American Football Coaches Foundation Randy Walker Power of Influence Golf Outing will be held on Monday, June 20, 2016, at The Ivanhoe Club. The Golf Outing is a part of the "Crossing the Goal Line" campaign launched by the American Football Coaches Foundation® (AFCF®) in 2006. This year's guest speaker will be announced soon. The ten previous golf outings have raised over $525,000 for the AFCF. The Chicago Golf Outing Committee set the income goal for this year's event at $200,000. An Auction and raffle featuring sports memorabilia and many other unique items followed the Golf Outing. We ask that you take a moment and view the highlights that are provided on this webpage from our past events and we encourage you to continue visiting this website for updates and additional information. Registration & Sponsorships - NOW Available! In part, this golf outing memorializes Coach Randy Walker, an influential head football coach who passed away suddenly in 2006. He had been heavily involved in the planning of this golf outing. Coach Walker left an indelible mark on college football during his 30-year coaching career. 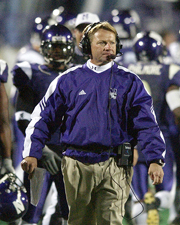 At Northwestern University from 1999-2005, Coach Walker helped bring along change in college football when he implemented one of the first "spread" offenses in the country. He became the Wildcats second-winningest coach and brought the Big Ten Championship to Evanston in 2000. He was fond of saying that "you can't teach character, you recruit and hire good people." College football was very fortunate to have a man of such high moral character, one who brought fame and honor to the profession in a dignified manner. His legacy lives on in his fellow coaches and in the many outstanding young men that he coached.